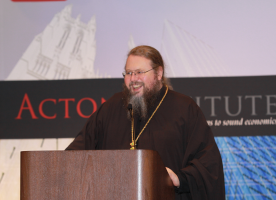 His Beatitude’s remarks were delivered at the Acton University plenary session on Thursday, June 16, in Grand Rapids, Mich. AU is a “four-day exploration of the intellectual foundations of a free society” with the aim of deepening students’ knowledge of philosophy, Christian theology and “sound economics.” This year’s event attracted more than 600 people from 70 countries across a broadly ecumenical spectrum that included Catholic, Protestant, Orthodox, Jewish and Muslim lecturers, students, clergy and business people. For more on the Acton Institute see its Core Principles, its scholarly Journal of Markets & Morality, the quarterly Religion & Liberty, and the PowerBlog. Download Aceticism and the Consumer Society (.pdf). Following traditional Orthodox (and orthodox) theology, the first of these terms—the flesh, the world and consumerism—refer to humanity in rebellion against God. Even when we refer to “the world” we are referring to how creation has become disordered by human sinfulness. Because of Adam’s sin and mine, my body, the creation and the works of my hands have all become estranged from God. Not only that, they have also become sources for my estrangement. As we have become estranged from God, oblivious to God, the body, created matter and the works of our hands, have become idols. They become the means of endless distraction from the reality of God, of communion with one another, and from both life and death. So is everyone who trusts in them (Ps 135:15-18). His wonders among all peoples (96:1-3). Just as our sin obscures our ability to perceive the beauty of creation and our own humanity, our obedience to God renews both and reveals their true beauty (see Romans 8:18-25). In the theology of the Orthodox Church obedience is our response to God. Broadly speaking this response has two foundations: holy baptism (and really, all the sacraments) and metanoia, that change of heart by which we turn personally from our sin and toward the Living God in “faith, hope and love” (see 1 Corinthians 13:13). But repentance is more than turning away from sin. It is turning to God, and allowing Him to renew and transform our very consciousness. It is turning from self-will to obedience, from egocentric “dancing alone” to synergy. It is only through a life of obedience to God that we can rightly exercise the gifts God has given us. Repentance renews our vision of creation, through our bringing our mind and heart into synergy with God. Fundamental to this obedience is the stewardship of the material world, and its proper use to glorify God. Through repentance God enlightens our hearts to see and know that the eucharistic Bread and wine become Christ’s body and blood; baptismal water is filled with the Presence of the Spirit and sanctifies us; oil of Chrism is sanctified and becomes the means of imparting the Gift of the Holy Spirit. These things, these material elements, are revealed not as ends in themselves, bread simply to be eaten and wine to be drunk, but become the means of communion with God. This sacramental vision ultimately extends to the entire creation, where everything is a means of communion, everything and everyone is filled with grace. It is not the creation that is found,wanting, but rather our hearts, our ability to perceive. This evening I want to speak with you about the second of the two foundations of the obedient life: repentance. How is it that, in response to divine grace, we can come to live in obedience to God? A second question, and one which I think speaks broadly to the lectures and conversations that have occupied you this week, is this: What does this obedient life mean for us who live in society that has become increasingly materialistic and driven more and more by a desire to consume rather than to sanctify creation eucharistically? While as religious believers we may disagree among ourselves as the to the exact nature, context and form of worship, if we are faithful to our respective traditions as Jews, Christians, and Muslims, we know that our disagreements do not obscure, and more importantly must not be allowed to obscure, our fundamental agreement with the anthropological fact that to be human in the fullest sense is impossible apart from the worship of God. Man was created with an intuitive awareness of God and thankfulness to Him for the creation. In return, the creation itself was made to be a means of communion and revelation of God to man. Man was thus created as a Eucharistic being, the priest of creation, to offer it in thanksgiving to God, and to use it as a means of living in communion, the knowledge and love of God. Man was created to worship. In our fallenness, turning from God to created things as ends in themselves, we lost the intuitive knowledge of God and our essential attitude of thankfulness to Him. Secularism is rooted in this loss of divine awareness, the darkening of our intuitive perception of the creation as the sacrament of God’s Presence. It is a denial of our essential reality as human beings, and our reduction to purely material animals. Thus the refusal to worship and give thanks, to offer the creation in thanksgiving back to God, is a denial of our very nature as humans. What Schmemann is testifying to is that “worship is truly an essential act, and man an essentially worshipping being.” It is “only in worship” that I can find “knowledge of God and therefore knowledge of the world.” As the etymology of the word orthodoxy suggests, the true worship of God and the true knowledge of God converge and are together become the foundation of obedience to Him. Alcoholism, drug addiction, the normalization of sexual immorality, as well as consumerism, and the pursuit of material prosperity as an end in itself, all of these are symptoms of the deep spiritual void created by secularism. The fruit of secularism is despair. I will leave to others better qualified than I to discuss and debate the social history of secularism and how we have come to be held so tightly in its grip. This evening I come to you as a pastor. While as the Primate of the Orthodox Church in America will often and necessarily require of me that I address social issues and matters of public morality, my primary concern always is as bishop and as Christian who God has entrusted with the great work of healing the wounds sin inflicts on the human heart. How does Christ liberate us from the “spiritual emptiness, loss of the meaning of life and blurred” morality that enslave each and every one of us both personally and as a society? This struggle IS the ascetical life and as an Orthodox Christian I believe that I cannot effectively preach the Gospel if I neglect my own person podvig, my own personal ascetical struggle to live a life in conformity to Christ. So clearly I am not referring here to “just any kind of asceticism.”7 Fasting, for example, simply to make ourselves more attractive to others is also a type of asceticism; it is the false asceticism of consumerism that encourages rather than mortifies our egoism. Likewise we can work longer hours so that we can simply own more things. This too is a false form of asceticism because it too is grounded in egoism. Can we not as religious believers and as men and women of good will, in our own lives, in the lives of our respective communities and in our society at the very least foster a renewed appreciation and practice of asceticism? +Jonah is Archbishop of Washington and New York and the Metropolitan of all America and Canada of the Orthodox Church in America. 1 Alexander Schmemann, For the Life of the World: Sacraments and Orthodoxy. (Crestwood, NY: St. Vladimir’s Seminary Press, 1973), p. 118. 2 Ibid., p. 120, emphasis added. 4 Basis of the Social Concept of the Russian Orthodox Church, X.6, emphasis in original. 5 On the Incarnation, trans. Archibald Robertson in Christology of the Later Fathers, ed. Edward Rochie Hardy (Philadelphia: The Westminster Press, 1954), 79. 6 Christos Yannaras. The Freedom of Morality. Trans. Elizabeth Briere. (Crestwood, NY: St. Vladimir’s Seminary Press, 1984), p. 112. An admirable lecture and an even more laudable attitude in interacting with the very hobourable Acton Institute. That is what engaging culture means in practical terms. Axios for Metropolitan Jonah on this! CST – Catholic Social Teaching course series with prerequisite. PST – Protestant Social Thought course series with prerequisite. I do hope and pray that we one day see a code like “OST – Orthodox Social Thought course series with prerequisite”. Is there an audio recording of this presentation?